To lose John Campbell so early into his time with us on Saturday was a real blow. John has made a real impact and has given the place a real lift since coming to us, and I couldn’t believe our luck when he went down in a heap. He’s had X-rays this week and fortunately his injury isn’t as bad as we first feared and we’ll aim to have him back in the fold within three weeks. John is a real natural goalscorer and hopefully he’ll be back on the pitch as soon as possible. It was great to see Anthony Hume step up to the plate on Saturday, and I thought he was equally as impressive in our superb 2-0 win at Buxton on Tuesday night. It’s a shame for Anthony that he is away on his stag do this weekend. That is poor timing for both us and for Anthony himself, he’s worked hard to get the opportunity and he’ll miss another important game for us on Saturday. Another player who has been waiting in the wings patiently is Kyle Fryatt, and he impressed me on Saturday and at Buxton on Tuesday. Due to a few commitments he had before he signed on for us, Simon Ramsden has missed a few sessions so far. We will have a good look at him this week with a view to getting him in the squad for Saturday. We’ve also done some business and brought in Lewis Maloney on dual-registration with Guisborough United. Maloney is a talented boy who was released by Middlesbrough and is just adjusting to playing senior football. He will come in for more midweek games as and when we need the support and I am sure he will impress when he does turn out for us. 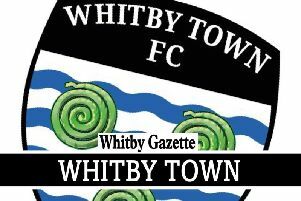 I was delighted to see James Risbrough score his first goal for Whitby Town on Tuesday night. James has had a few issues since signing for us and I am pleased he’s put them behind him and is starting to hit the ground running for the club. We have a lot of injuries and niggles heading into the weekend, with Kieran Weledji and Andy Monkhouse a doubt as well as the other injured players, so I will be looking to do some more business this week to try and bolster our numbers.